I have created a google+ group for builders assistance. If you want to build one feel free to ask any questions you have there. 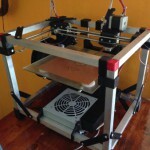 To build one of these printers I’m trying to make it as straight forward as possible. Y Axis complete parts. 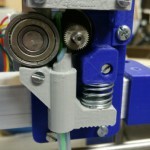 motor holder has breakaway support built in. 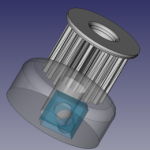 Z Axis Complete parts are provided with various options. The shaft and motor holders are solid and open mounts. the open mounts can be added to the frame after being build the solid ones need the frame to be opened to be added or removed. 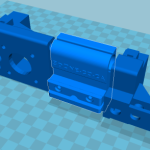 This is a belt tensioner that can shorten a belt by upto 11mm with a cable tie its a solid single print that takes about 10 minutes to print. All parts needed for the X Axis in one stl file. You can split the stl into parts to print individually or to re arrange them on the build plate they are arranged in the STL as the are assembled. 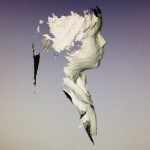 I’m still collecting the stl files to upload please give me a day or so to complete.